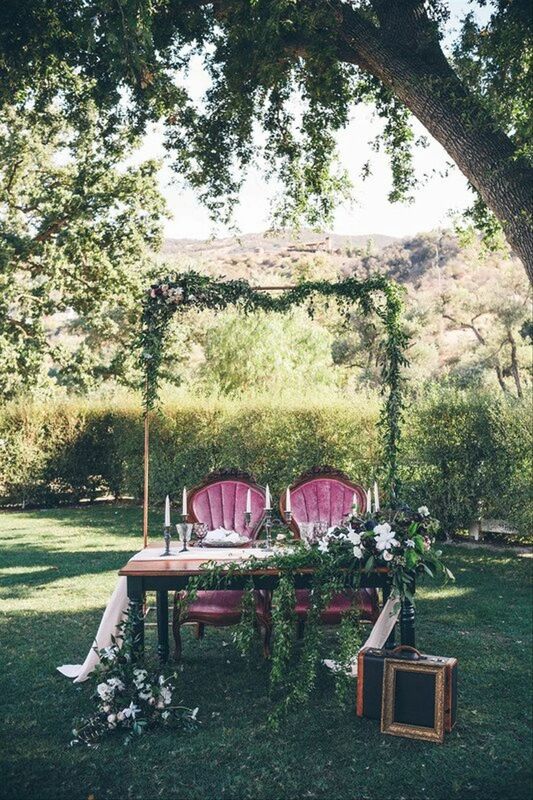 If you're ready to get lost in each other's eyes at your wedding reception, these sweetheart table ideas won't disappoint. Your wedding day is supposed to be one of the most romantic days ever, but like it or not, it can also be a little hectic. Eating at your reception might be one of the few times you have a chance to actually sit down with your brand new spouse, so we've rounded up our favorite sweetheart table ideas to help you make the most of those precious moments. 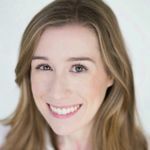 Choosing to have a sweetheart table (a table for just the newlyweds) at your reception will give you an undisputed opportunity to focus on each other — if only for the duration of a quick meal. 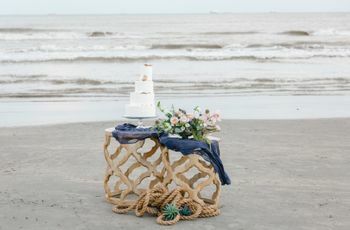 From simple greenery garlands to elaborate backdrops and custom creations, your sweetheart table is also a great opportunity to spotlight your wedding style and personalities. 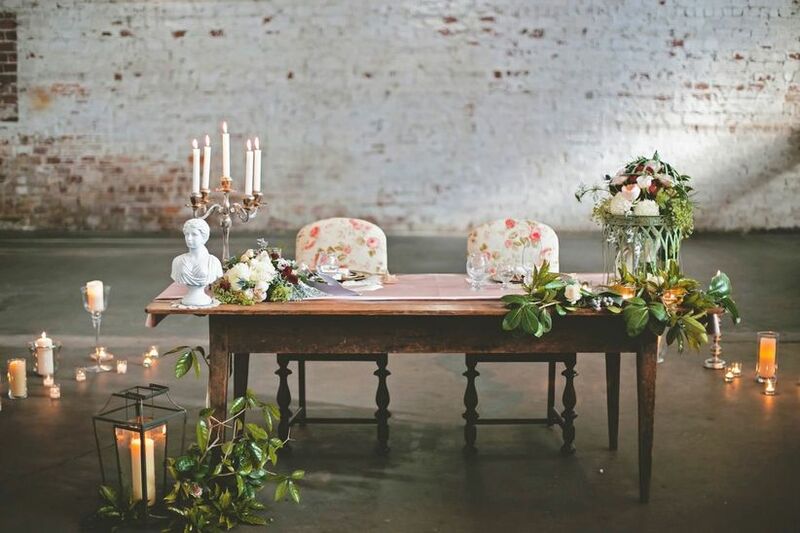 Keep that "just married" feeling alive with these sweetheart table ideas. 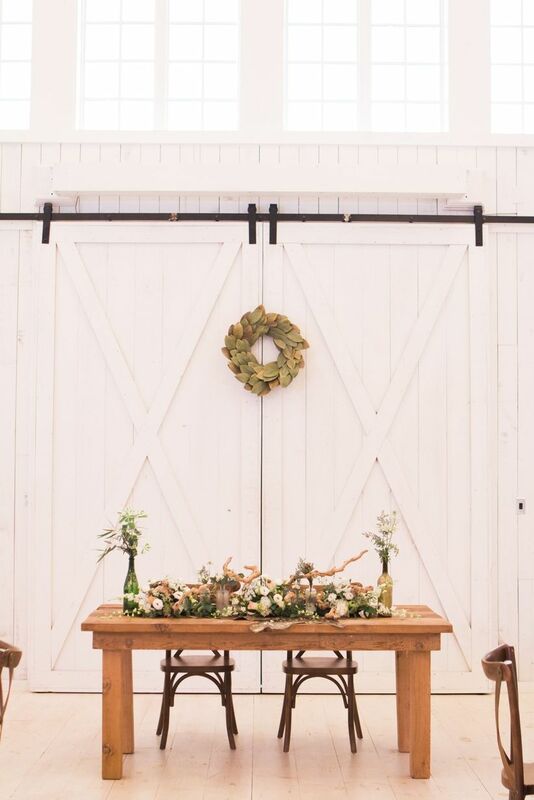 If you're getting hitched in a barn or country setting, a bare wood table is excellent for creating a modern farmhouse wedding vibe. 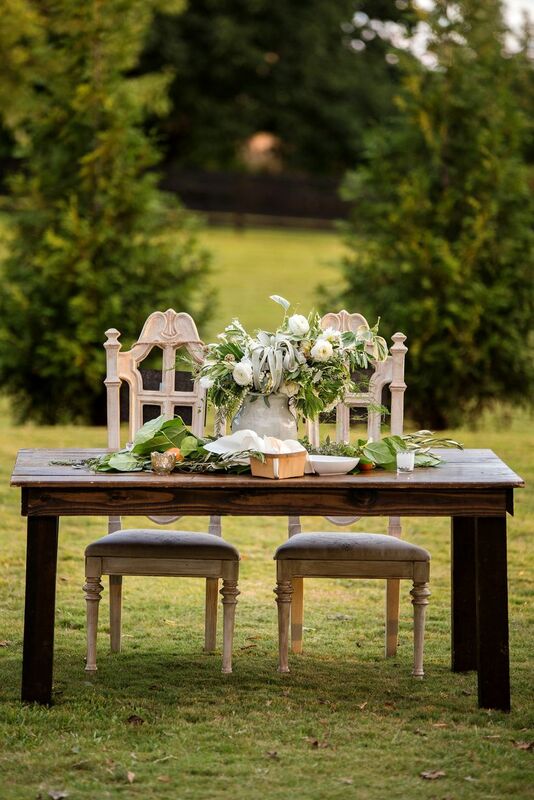 Incorporate green and white florals, natural elements like driftwood and wildflowers, and cross-back chairs to accentuate the upscale rustic look. 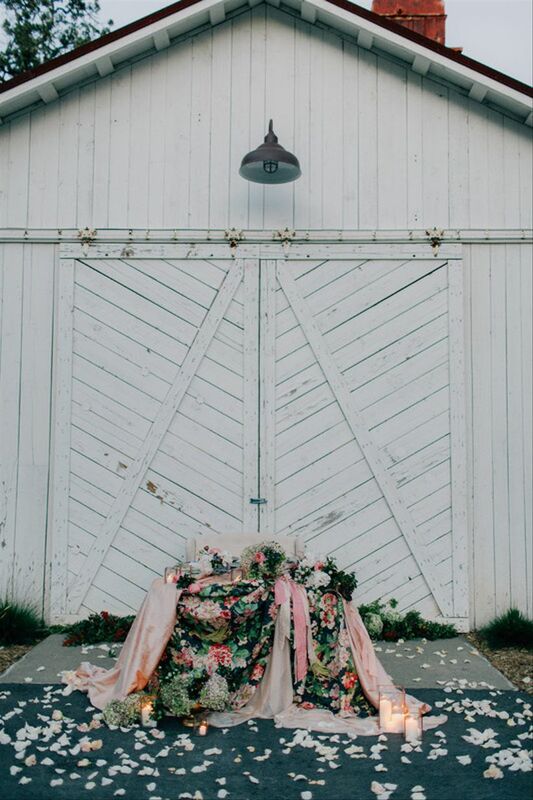 Floral wreaths are one of the latest wedding trends we're loving, and clearly they make for stunning sweetheart table ideas, too! 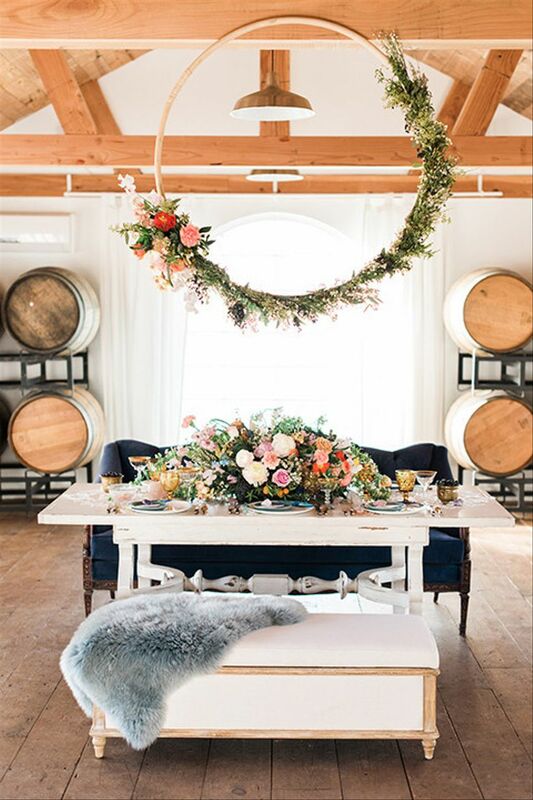 Suspend one of these circular beauties above your sweetheart table to really wow your guests and create a photo-worthy setup. Think blush has seen its 15 minutes of fame? Think again! Reinvent this pastel hue in a modern way for your sweetheart table by adding cheerful peach accents and bold black details atop crisp white linens. It's romantic and fresh but not overdone. Another wedding decor trend we're so excited about is the return of bold statement-making colors. 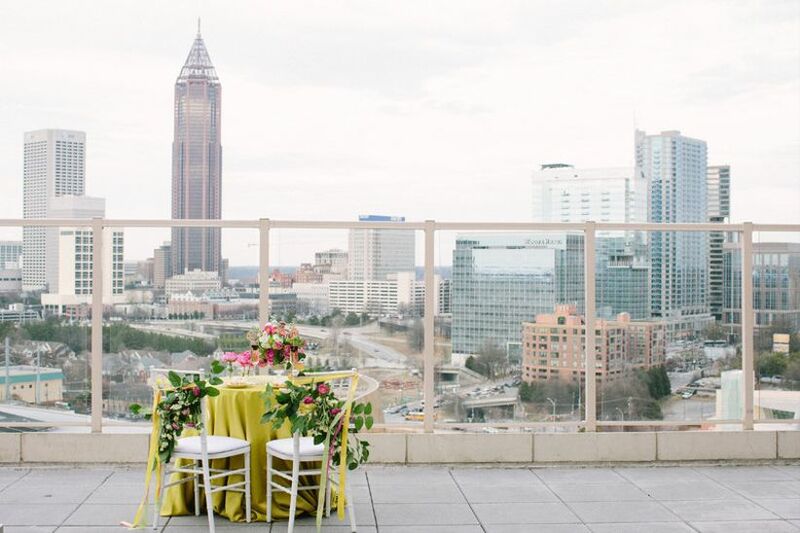 A chartreuse sweetheart table stands out (instead of blending in with the skyline) at a modern rooftop venue with amazing views. 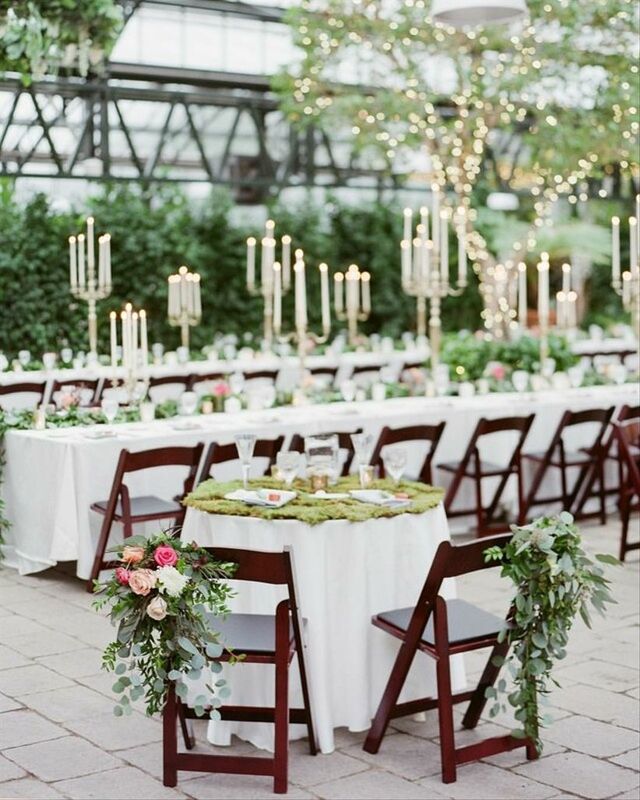 Play up the whimsical vibes of a bright color palette by adding greenery and trailing ribbons to your chairs. 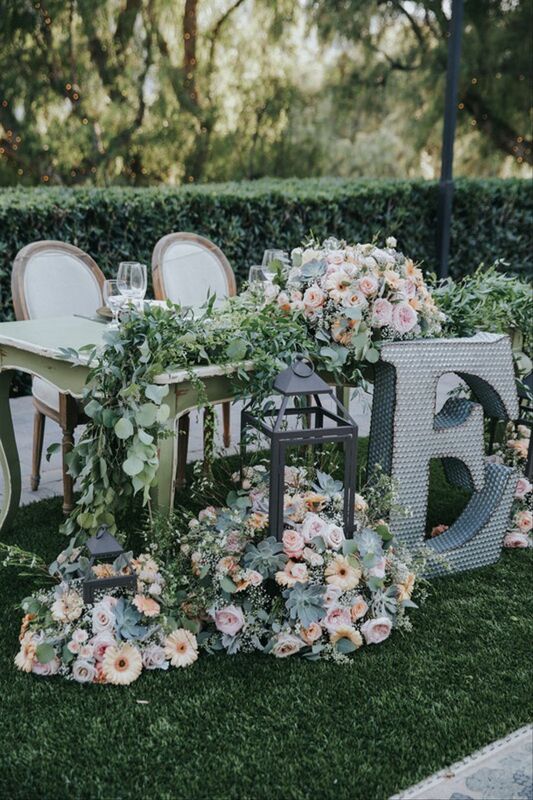 This greenery-flower combo is one of our favorite go-to sweetheart table ideas. It's easy to recreate and looks amazing every time! 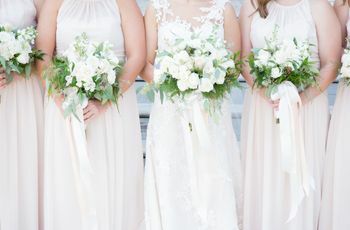 Ask your wedding florist to create lush greenery garlands to drape over the edges of your table, and then personalize it by adding clusters of flowers throughout. Hydrangeas and roses are two lovely options! 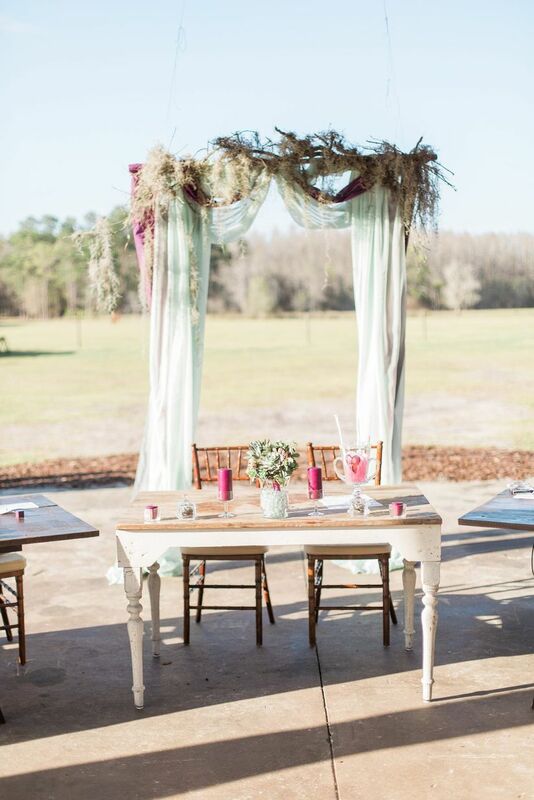 Even if you aren't in the South, you can recreate the romance of a southern setting by using Spanish moss as a backdrop for your sweetheart table. All it takes is a base structure, fabric swags, and clusters of Spanish moss — the more undone, the better! 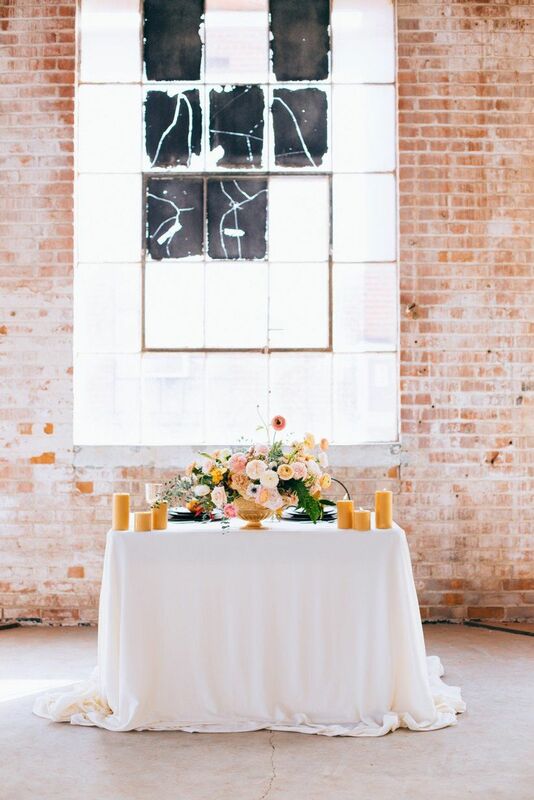 You can even use a backdrop like this for your ceremony and repurpose it later on during the reception. This garden-inspired idea has us swooning. If you're having an outdoor reception, use your venue's natural elements to your advantage. 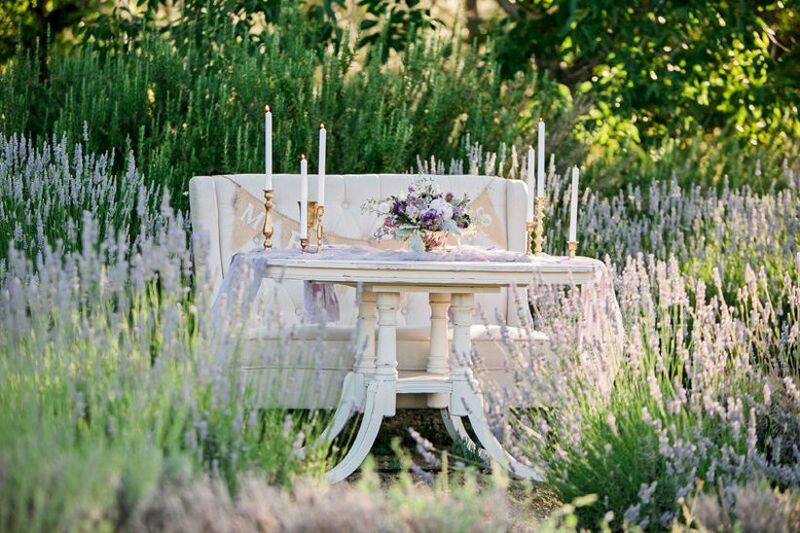 Set up your sweetheart table in (or near) a wildflower patch, herb garden or meadow — with the venue's permission, of course! If that's not possible, you can recreate this look by using dozens of potted plants to surround your table. Lavender, sage, heather, and delphinium are just a few blooming options. Neutral, monochromatic colors and minimalist details don't have to be boring. 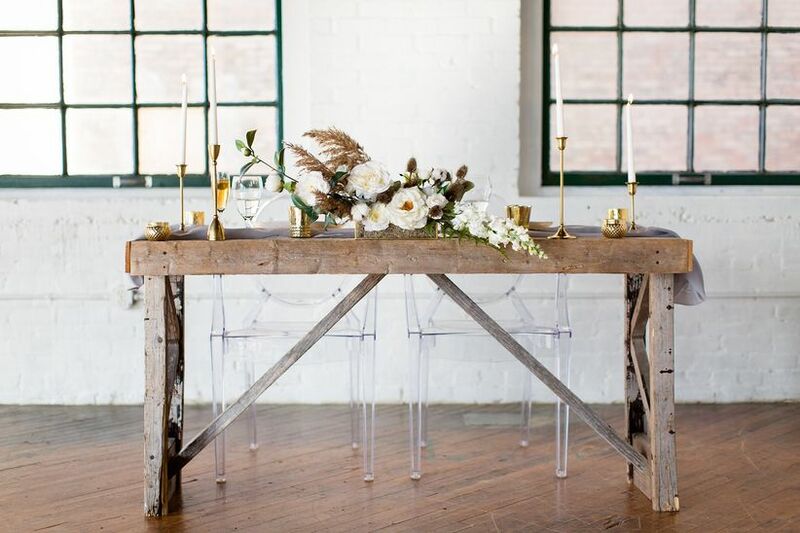 Start with a bare table (unfinished wood adds a bit of edginess) paired with modern ghost chairs. Complete the setup with gold mix-and-match candlesticks and a white centerpiece with dried accents, like pampas grass and thistle. What better way to celebrate your newlywed status than by showing off your last name with a giant initial letter? Let the monogram stand on its own or add extra oomph with bundles of flowers and greenery. 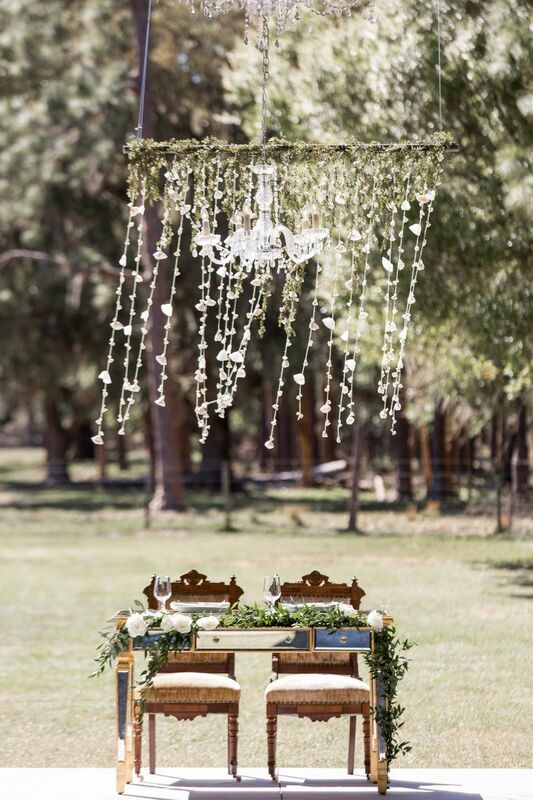 This sweetheart table reminds us of a gorgeous vineyard wedding somewhere in the European countryside. To create an organic, farm-to-table aesthetic, keep your decor effortless and natural. All you need is a handful of leaves (plucked straight from the garden) and an oversized floral centerpiece in a simple ceramic vessel. Finish with a dark wood table and ornate upholstered chairs, and don't forget the basket of homemade bread! 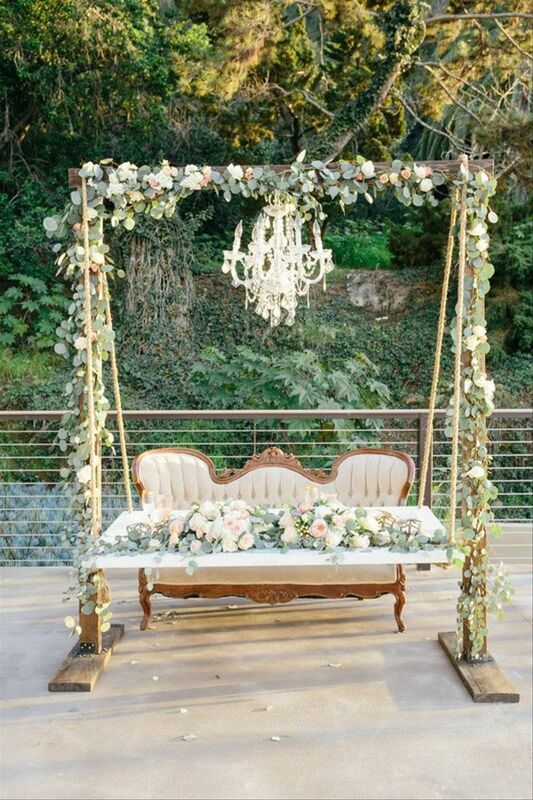 When it comes to sweetheart table ideas, this suspended installation goes above and beyond, and that's why we love it! You'll feel like total VIPs at your wedding reception with a setup like this one, thanks to the elaborately decorated hanging table, sparkling chandelier and vintage settee. Achieve a cool, modern tropical wedding theme by sticking to an all-white color palette for the basic items, including your table, chairs and candles — bonus if the wall behind you is also white. 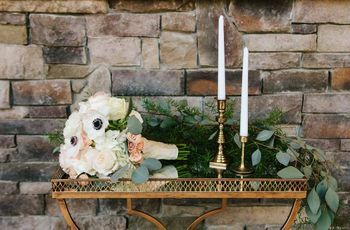 Selectively incorporate color by using metallic accents and an eye-catching floral installation with trendy blooms, like proteas, succulents and eucalyptus. Turn your sweetheart table into a true focal point by topping it with a patterned tablecloth. 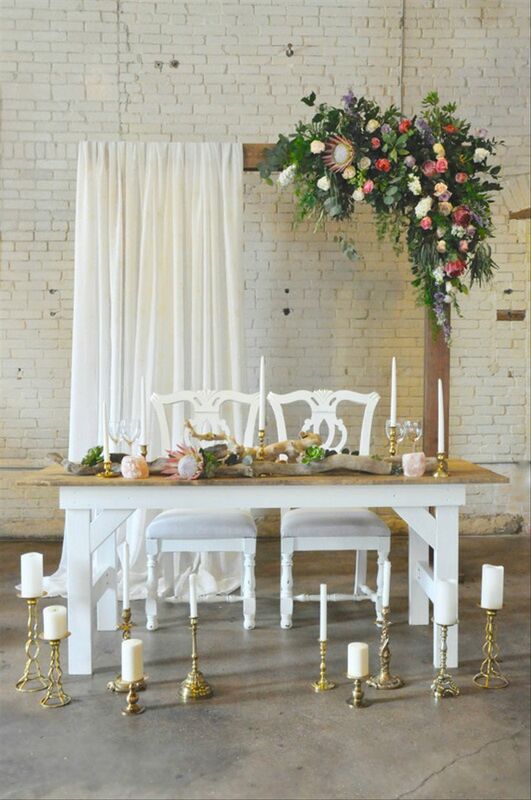 Drape contrasting linens on top to add dimension, and finish the look with candles and scattered flower petals. 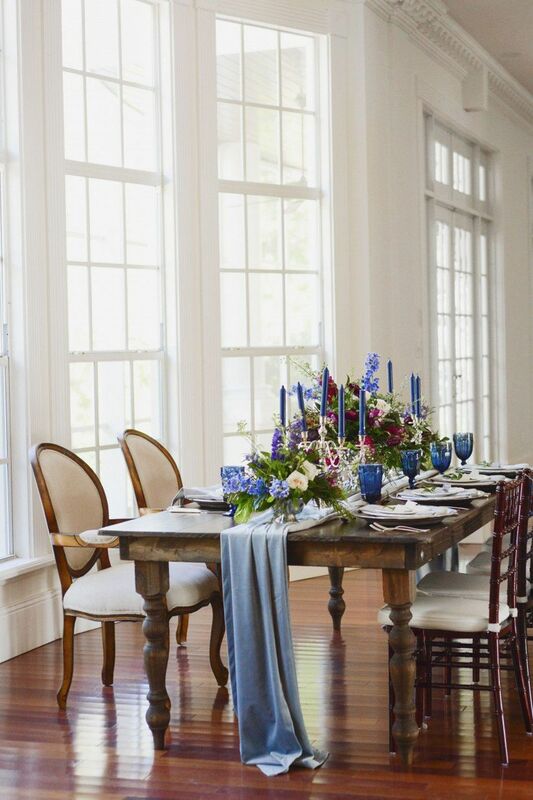 Avoid pattern overload by using plain linens for the guest tables. 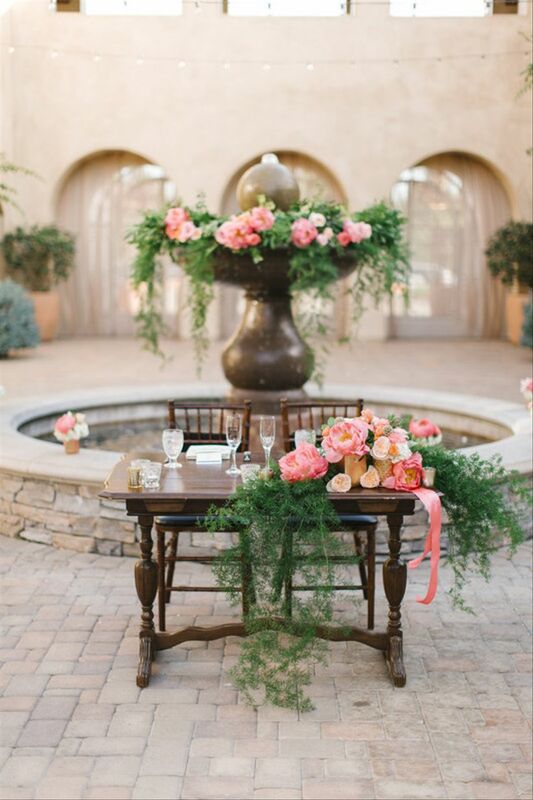 If you love coral charm peonies and peach garden roses, this sweetheart table idea will do the trick. Group a few of these bright blooms to one side of your table for a dose of color that's just right. 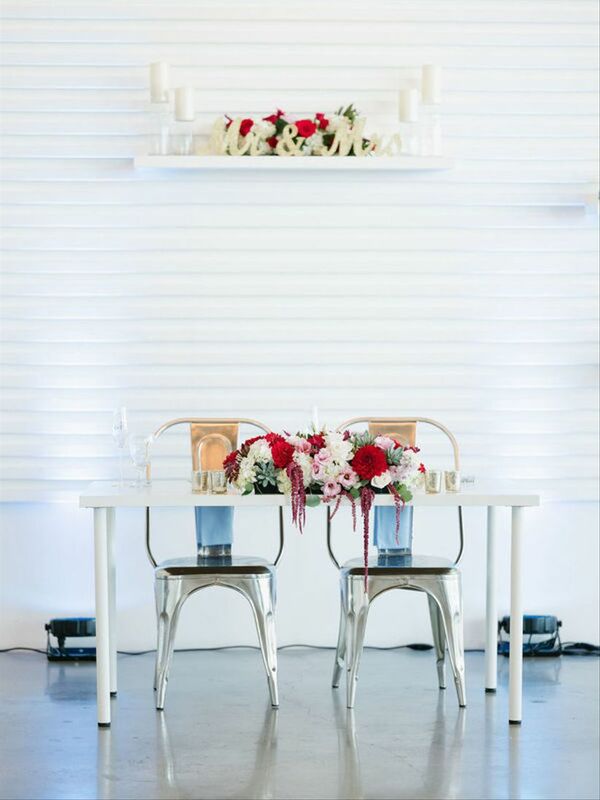 Sweetheart tables don't always have to be over-the-top. This understated look is all about the layered linens, and it's easy enough to achieve. Start with a tablecloth in a solid color, like mauve or blush, and top it with sheer fabric to create dimension and drama. 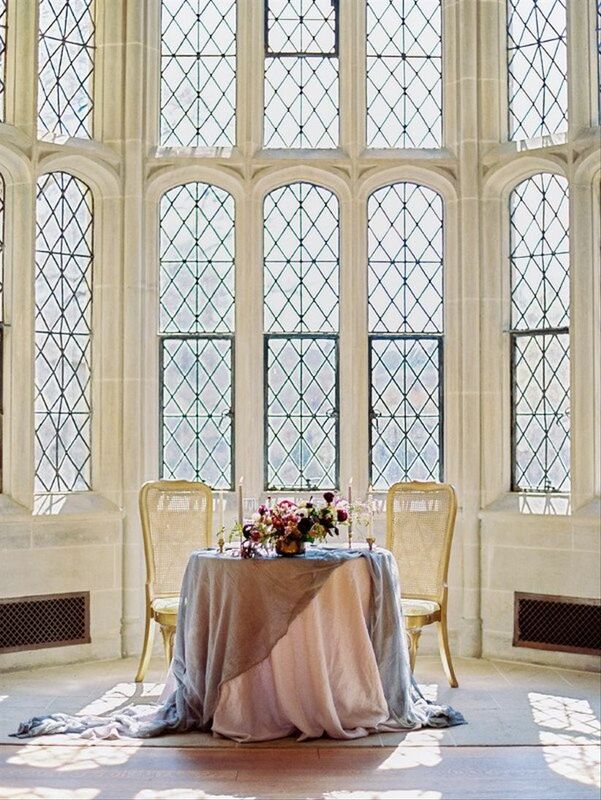 Gold cane back chairs add contrast to the moody wedding colors, with an end result that is beautifully timeless. 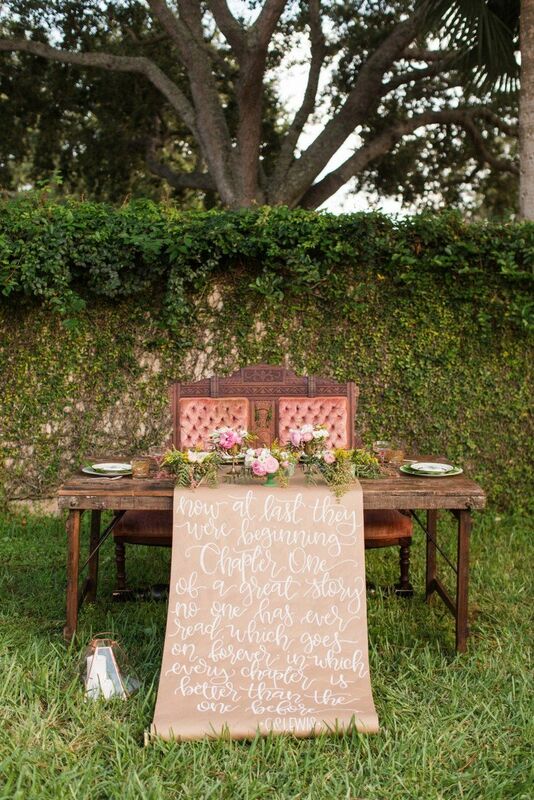 We love all types of wedding calligraphy, but this is oversized scroll is one of our favorite sweetheart wedding ideas for bookworm couples. Choose your favorite poem or quote, and then let your wedding calligrapher work their magic to create a one-of-a-kind addition to your reception decor. 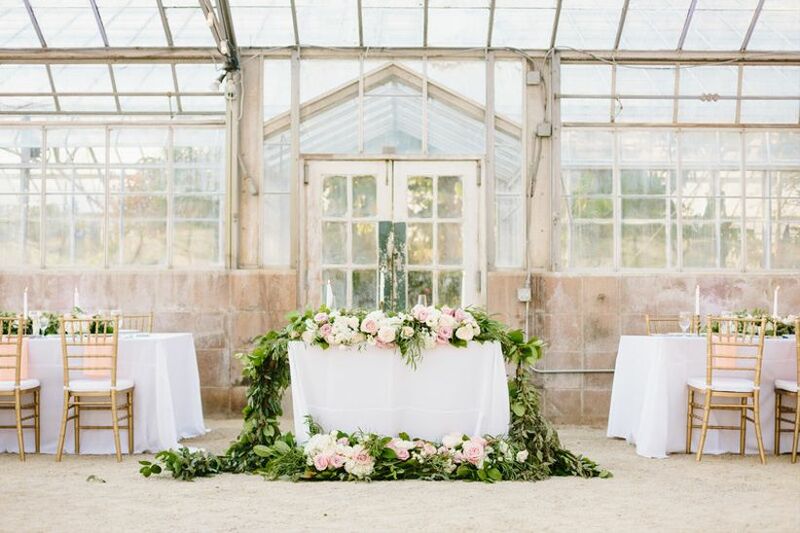 A moss-covered table might seem crazy at first, but if you're getting married at a garden or greenhouse, this sweetheart table idea makes perfect sense. Skip the traditional centerpiece in favor of a few votive candles and decorative chair arrangements. Going for tasteful, royal-inspired decor? Use rich gemstone hues, like sapphire blue, amethyst purple and ruby red to create a sweetheart table that's undeniably regal. 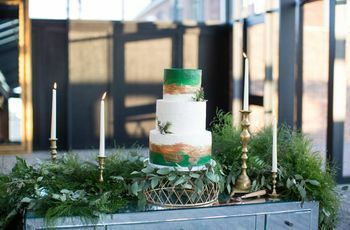 This color palette is especially ideal for fall and winter weddings! A custom neon wedding sign is a must-have for any trendsetting couple. Personalize yours with a favorite quote or romantic saying, like "always means forever," or opt for a motif that matches your wedding theme (like a heart). 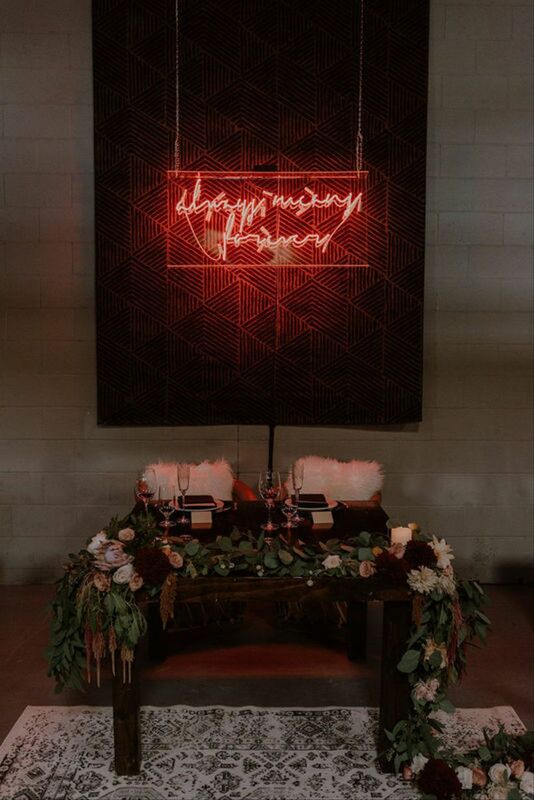 Display the neon sign above your sweetheart table, then add trendy accents like faux fur pillows and floral garlands for a design that's totally Instagrammable. Vintage meets coastal with this laid-back setup featuring antique chairs and a mirrored vanity acting as a sweetheart table. A seashell and greenery curtain brings a hint of beachy style to this vintage chic combo. Get inspired by retro style (à la the 1950s and '60s) by using items with clean lines and chrome finishes for your sweetheart table. Metal marais chairs are a funky urban-meets-chic way to complete the look. If your reception is taking place in a scenic location, use a structural backdrop to frame the gorgeous view behind your sweetheart table. Keep the rest of the decor low to the table or on the ground so you don't detract from the picturesque surroundings.